Vintage Pair of Midsized Buchan Casserole Dishes with Lids OVENPROOF 7" x 4.75"
Scottish Stoneware. They weigh 1kg together and are fully marked on the bases. A Pair of really lovely Buchan Casserole dishes, would roughly contain "two/three serves" for mains, or vegetable dishes in general. Buchan Stoneware (Scotland) Brittany casserole dish. 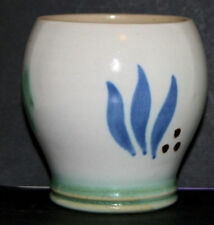 Lovely, unusual piece. Shows almost no signs of previous use. Lovely pair of casserole dishes by Buchan Pottery in Thistle pattern. 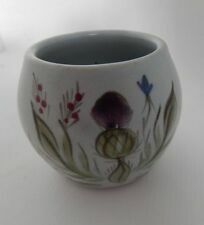 BUCHAN POTTERY SCOTLAND THISTLEWARE. 2 X CASSEROLE POTS / DISHES 10 IN X 7.5 IN X 3.5 IN TALL. 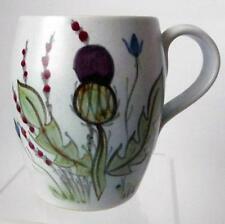 FINEST STONEWARE. ITEM CONDITION. ❈ MANUFACTURER IS BUCHAN. 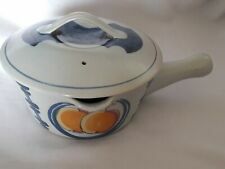 ❈ A LOVELY OVAL OVEN PROOF CASSEROLE SERVING DISH WITH LID. 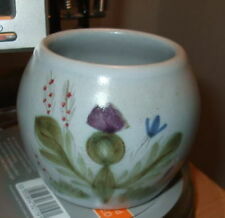 ❈ PATTERN IS THISTLE - PURPLE THISTLES AND BLUE HAREBELLS ON A LIGHT BLUE GROUND. As such they will not be in 'new' condition. 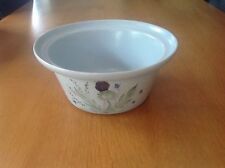 Buchan Stoneware, Riviera, Open pie dish / casserole. Has a glazed inner rim for the pie crust to sit. "Riviera, M7-185, 257/40". Second class small parcel rate to UK mainland is £3.30.